Because I lacked time to know more details about Paano Ako Naging Leading Lady The Musical, I hit my sit without expecting that Frenchy Dy was going to totally entertain me with her superb singing and acting skills. She is paired with Hans Eckstein to topbill the very amusing play. Their scene showing how the two met for the first time was epic- thanks to the spinning ground effect. Honestly, I did not know that it was the Star in A Million grand champion, who started the play with a scene of her doing her laundry against the “sampayan” background. The opening scene gives a glimpse of a local color. If it was a European play, it would have been set in a small hut in a kingdom. As Frenchy’s character Melly develops, everyone in the audience nods why the play falls under the romantic comedy genre. Even the name of the characters including Viva and Popoy are literally funny. The play is undeniably entertaining, but it goes beyond what is pleasing to the ears and the eyes. 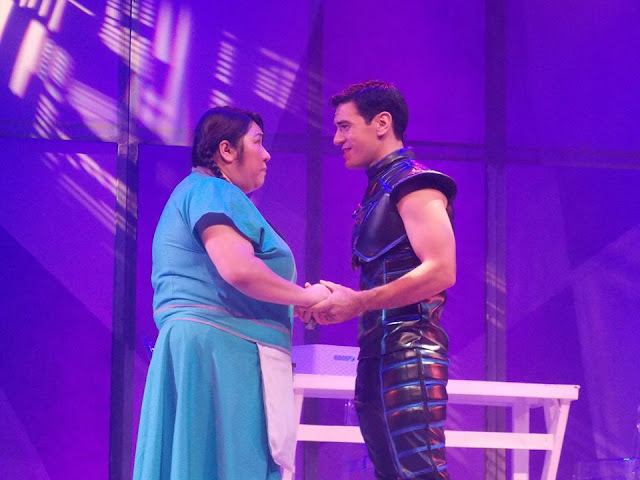 Giving elements a second thought, the play surfaces the reality that Filipinos prefer the mestizo over the moreno, represented in the Fuwerza Filipinas vs. Kayumanggilas conflict. If the writer of the play had intentions of creating social changes through the play, I admire how everything was rolled out. It is a witty play, and it did not concrete on the deep philosophical favors of the brain behind it. Regarding the script, it was brilliant. My favorite line was “Relax, your shaking molecules”. Although the play did use a moderately vulgar language, the script appeared very positive to the audience. The most powerful production number for me was the welcoming of the new maid. It looked foreign because of the apron used, but the choreography was solid. The scenes shifted from mere excitements to greater pleasure of falling in love. I did fall in love with the love story of Melly and Leading Man. The twist as to whom the “Kung Paano AKo Naging Leading Lady” belongs to also hit my brain cells at the end of the play. Intelligent play it is. Beyond the entertainment I got from the play, I give credits to the team behind it for leaving the audience a taste of how the spotlight could be shared by all major characters and not only owned by the main protagonist. Get your tickets now to dig deeper. Buy your tickets now by clicking here.